By the fall of 2015, a young man from the San (Bushman) tribe of Botswana, the first of his people to graduate from high school at the top of his class, will be ready to pursue an undergraduate degree in engineering at any university in the world. His tuition will be covered by a national award, granted by the Botswana Ministry of Education for excellence in academics. Ketelelo Moapare is the first San to win this prestigious award and it is all because a library came to his village when he was thirteen years old. Ketelelo was orphaned shortly after his birth among the San people on the Central Kalahari Game Reserve, where the San tribes hunted and gathered for more than 20,000 years in the Kalahari Desert. In the late 1990s, the government of Botswana began to forcibly remove the San people to assimilate them with the rest of the Botswana culture. Ketelelo, now under the care of his grandparents, was transplanted to New Xade, a settlement near the town of Ghanzi. Fast-forward to 2007. Ketelelo is 12 years old with an insatiable curiosity. Like the other children in the village, he was very interested in the white-skinned foreigner from New York who was working in the clinic and living in their village. Ed Pettitt, then 22 years old, was a Peace Corps volunteer sent to do HIV/AIDS testing and prevention in this remote village, 70 miles from the closest town with electricity. “There was no way to communicate with the outside world besides a HAM radio,” Ed said. The road into New Xade was a dirt path and the only vehicle that came in and out was a covered pick-up truck that served as the village ambulance. Ketelelo met Ed one scorching hot day when Ed’s solar power fan started spewing black smoke. He’d given it up for useless when Ketelelo asked if he could take a look. Ketelelo took the fan apart and put it back together—fixed! The other kids started calling him the “Bush Mechanic.” Ed knew then that Ketelelo was bright and capable of learning at a remarkable pace. “I helped teach him English while he taught me Setswana [the national language],” says Ed. Ketelelo’s native language is a click language called G//ana, but he was also fluent in the national language. Ketelelo learned to read English with Ed’s Newsweek and National Geographic magazine subscriptions. Meanwhile, Ed was surveying the village to find out what they needed most. Peace Corps Volunteers come with only a partial idea of what they will do at their post and spend their first few months conducting a needs assessment. While originally sent to conduct HIV/AIDS testing and prevention, Ed found that HIV didn’t spread rapidly to the San population because of their isolation from the rest of civilization. Only a handful of mothers were in need of treatment. The villagers were clear that education was their highest priority. They were losing their traditional way of life—hunting and gathering—and needed new ways to support themselves. They told Ed they needed advocates to speak for the San people and so they wanted to educate the youth. Kids in New Xade went to school, but it was staffed by the majority-people group, the Tswana, and taught only in Setswana—not their native tongue. The San kids were marginalized by the teachers and bullied by their peers. Ketelelo’s generation was the first to be literate. “The entire history of these people has never been written down. There is no written language,” says Ed. “We need books,” the villagers told Ed. There was a building designated as a library, but the shelves held no books. Enter the African Library Project, a relatively new nonprofit organization at the time that Ed found out about through his Peace Corps network. The ALP sent donated books to start libraries in Africa—exactly what New Xade needed. While getting groceries in the closest town, Ed called Chris Bradshaw, founder of the ALP on her home phone. It was late at night in California, but Chris answered. To Ed’s delight and surprise, she invited him to write a proposal for the library, which was later approved. The ALP worked with the McDermott family to collect one thousand books for the New Xade library. It took a year and a half to collect all the books, ship them to Botswana, and finally transport them via the village “ambulance” to the San village in the Kalahari Desert. Ketelelo was the library’s first patron, says Ed. He helped unload the books and organize them according to the Dewey decimal system. There were board books for the smallest children and early readers, picture books, young adult novels, adult novels, and nonfiction, including science, politics, and economics. Later, the U.S. Embassy in Botswana cleared out its office and donated all its books to the library in New Xade. “These books were [Ketelelo’s] connection to the outside world,” says Ed. He read anything and everything, says Ed, even textbooks about chemistry. Ketelelo lived in a grass hut with his grandmother, sleeping on a blanket in the sand. But the library quickly became a second home. “I was excited and I felt blessed because windows and doors to the outside world were now opened to me,” writes Ketelelo in an email interview. By this time, Ed had finished his three years with the Peace Corps and was living in Houston. He returned to the capital of Botswana to help open a new adolescent clinic in July 2013, which happened to be the same time Ketelelo was in the city receiving his national award and scholarship from the Botswana Ministry of Education. He needed to complete what is called “A-levels” before qualifying for university, a two-year post secondary program which requires enrolling in expensive private schools. Thankfully, the government of Botswana is paying for these, too. Ed was able to help Ketelelo get enrolled at Maru-a-Pula, the premier private school where international, professional expats in Botswana send their children. He served as Ketelelo’s guardian since his grandparents were still living in New Xade and were illiterate. “[My grandparents] are really happy and very proud of me, because I am the first person from our family and New Xade community to attain this magnitude of academic excellence,” Ketelelo writes via email. “I feel so proud of Ketelelo. If I was any older, or in a different stage of life, I might have adopted him,” says Ed. “I am very glad to have met Ed Pettitt, he has made me who I am today. He is not only a friend but a parent, a mentor and a role model, without him I do not believe I would be where I am today,” Ketelelo writes. All of this happened because of the African Library Project. Anyone can start a library in Africa and change a life like Ketelelo’s by starting a book drive and raising $500 for shipping costs. 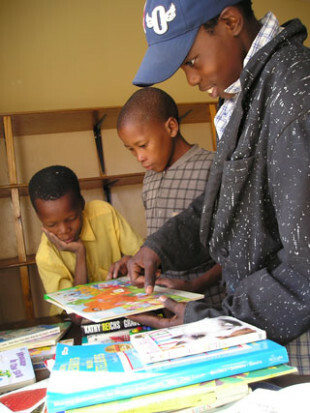 The ALP matches book drive volunteers with a library in a specific village in Africa. Over 1 million books have been donated to start libraries in Africa since the ALP’s founding in 2005. The ALP was founded by Chris Bradshaw and her family after traveling to Lesotho for family vacation. Chris decided to work to end poverty and illiteracy by starting libraries across Africa. Since then, the ALP has helped start more than 1,000 libraries in Botswana, Cameroon, Ghana, Lesotho, Malawi, Nigeria, Sierra Leone, Swaziland, Zambia, and Zimbabwe. The ALP works with communities in Africa to provide training on setting up and running a library to encourage good library practices. Photos courtesy of Ed Pettitt. Kudos to this young man for his academic success and to the government of Botswana for ensuring that he will have the resources he needs to continue his education. One minor point of clarification, though….his generation is not the first San generation to be literate – we taught many San students at Itekeng Community Junior Secondary School in Ghanzi more than three decades ago. I have very fond memories of my time there. Hi Kathy, thank you for your note! Were you a Peace Corps Volunteer as well? As for the point of clarification, Ketelelo’s generation is the first generation of Dcui and Dxana from the Central Kalahari Game Reserve to have widespread access to primary and secondary school education due to the relocations of 1997 and 2003. Prior to the relocations, relatively few Dcui and Dxana children graduated from the primary school at Old Xade (many from the other villages in the reserve did not attend school at all) and even fewer completed secondary school. The Naro, on the other hand, have had a longer history of literacy due to their more settled existence around D’Kar and the Ghanzi farming block. Dcui and Dxana are alternative spellings for G/ui and G//ana, respectively. Thank you for weighing in, Ed! This community has such a fascinating history and a promising future, if Ketelelo is any indication! Books completely changed the course of this young San Bushman’s life. I’m so glad the African Library Project was able to reach him. So sad how much potential is slipping down the drain in Africa as young minds are not challenged or nurtured with new ideas. Thanks for writing this, Naomi! It was a joy to write this story, Chris. Thanks for your inspiring work with the African Library Project. Couldn’t agree more, Alexis! Thanks for your comment. Thank you for sharing this inspiring story! Books DO make a difference. I’m glad you liked it Deborah! I really enjoyed writing this one, too.